If ever the “lipstick on a pig” metaphor were appropriate, this is the case. I recently wrote about the new service Lufthansa will operate between Frankfurt and Pune, India. The route has traditionally been operated by a Privatair 737, but Lufthansa’s partnership with Privatair ended. Due to the short runway in Pune, no wide body aircraft can be accommodated. Rather than sacrifice the route, Lufthansa is operating it with an Airbus A319, featuring slimline seats throughout the aircraft. 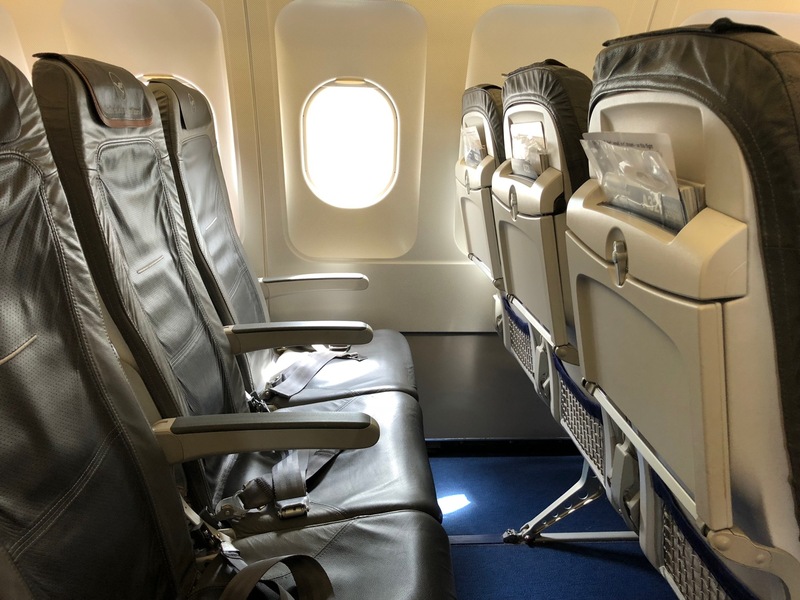 The “business class” seat is identical to economy class, Lufthansa has just traditionally blocked the middle seat, thus providing a bit more elbow room. The flight will also make fuel stops in Baku, Azerbaijan in both directions, bringing total flight time to over nine hours. I get the sense that Lufthansa received a lot of criticism about the idea of charging over $3,000 USD for a “business class” flight on an A319 and has made one modification to the route, albeit an important one. Instead of just blocking the middle seat, according to the flight seat map each passenger in business class will receive her own row. That will allow for a “lie-flat bed” kinda, sorta. It’s not an ideal solution because the length and width of the “bed” are smaller than a real business class seat, but with a plush mattress pad, couple pillows, and blankets…well, at least this is better before. It was already a given that business class passengers would receive meal service akin to Lufthansa’s other routes to India. The A319 has no built-in IFE, but business class passengers will receive a voucher to stream movies for free (while economy class passengers will be able to stream for a fee). I like this solution. A better solution, however, would be real business class seats. I’m sure there are other markets where Lufthansa could support a more premium seat at a premium price. Maybe Moscow and Tel Aviv, like British Airways and SWISS offer upgraded service to? In any case, this seating change makes the flight a bit more bearable. I still will not be in a rush to take it. > Read More: What The Heck Is Lufthansa Thinking? Having flown the FRA – TLV and back route numerous times stuffed into a crummy LH A321 I certainly agree with your assessment. Hey Lufty is a “five star airline” lol. Looks like they have changed their mind. It has now been replaced with a Privatair B737-700 and now 6x week. I wonder if all this negative press had an impact?